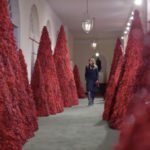 Today an image surfaced on social media of Melania Trump supposedly walking through the most hideously ugly White House Christmas decorations of all time. It was so laugh-out-loud ridiculous looking, we initially thought it was some kind of obvious fake. Then, somehow, it turned out to be real. Seriously, Melania Trump, what is wrong with you? No one has decorative tastes this bad. No one. 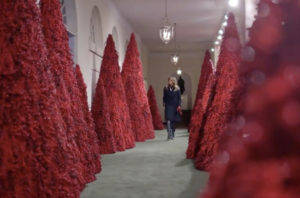 She is, rather obviously, trolling us yet again, this time by turning the White House into some kind of haunted popsicle farm instead of decorating it for Christmas. It seems Melania’s job in this Trump nightmare is to add insult to injury. His ouster, and her departure accordingly, can’t come soon enough. We just hope Mueller doesn’t get attacked by those giant red furry things when he shows up with arrest warrants.